Save some time. Here is the only piece you need to read about the subject of government openness, with all its implications for honest policy, court politics, and citizen empowerment. And as you might expect, it’s a fairy tale. 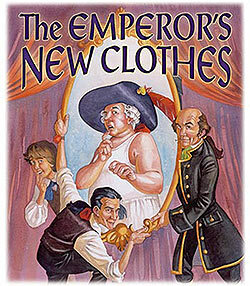 “The Emperor’s New Clothes.” Go on, read it – you haven’t read it since childhood, have you? It’s short, so after you finish it take a moment, if you like, to comment back with your thoughts. The full text follows, translated from Kejserens nye Klæder, by Danish poet and author Hans Christian Andersen. There’s also an intellectually annotated version here at SurLaLune, by Information Science scholar Heidi Ann Heiner. Once upon a time there lived a vain Emperor whose only worry in life was to dress in elegant clothes. He changed clothes almost every hour and loved to show them off to his people. The chief of the guards heard the scoundrel’s strange story and sent for the court chamberlain. The chamberlain notified the prime minister, who ran to the Emperor and disclosed the incredible news. The Emperor’s curiosity got the better of him and he decided to see the two scoundrels. “Besides being invisible, your Highness, this cloth will be woven in colors and patterns created especially for you.” The emperor gave the two men a bag of gold coins in exchange for their promise to begin working on the fabric immediately. “Just tell us what you need to get started and we’ll give it to you.” The two scoundrels asked for a loom, silk, gold thread and then pretended to begin working. Of course the Emperor did not see any colors and could not feel any cloth between his fingers. He panicked and felt like fainting. But luckily the throne was right behind him and he sat down. But when he realized that no one could know that he did not see the fabric, he felt better. “Your Majesty,” the prime minister said, “we have a request for you. The people have found out about this extraordinary fabric and they are anxious to see you in your new suit.” The Emperor was doubtful showing himself naked to the people, but then he abandoned his fears. After all, no one would know about it except the ignorant and the incompetent. “All right,” he said. “I will grant the people this privilege.” He summoned his carriage and the ceremonial parade was formed. They all tried to conceal their disappointment at not being able to see the clothes, and since nobody was willing to admit his own stupidity and incompetence, they all behaved as the two scoundrels had predicted. A child, however, who had no important job and could only see things as his eyes showed them to him, went up to the carriage. “The Emperor is naked,” he said. “Fool!” his father reprimanded, running after him. “Don’t talk nonsense!” He grabbed his child and took him away. The Emperor realized that the people were right but could not admit to that. He thought it better to continue the procession under the illusion that anyone who couldn’t see his clothes was either stupid or incompetent. So he stood, stiffly on his carriage, while behind him a page held his imaginary mantle, carrying the train that wasn’t really there. First, a quick story from when I was working in government. Not long after the initial establishment of a “Director of National Intelligence,” the DNI CIO held an inaugural “DNI Information Sharing Conference” in Denver in the summer of 2006. I was asked to sit on a panel about “Innovation across the Intelligence Community,” representing the Defense Intelligence Agency and sharing the stage with two counterparts, from the CIA and NSA. Our panel chair was Mr. CJ Chapla, then the Chief Technology Officer (CTO) of the old Intelink Management Office, redubbed “Intelligence Community Enterprise Services,” an office now under the Office of the DNI (ODNI). CJ asked the three of us to describe briefly the goals and projects we were each working on, and in seriatim that’s what we did for 90 minutes or so.